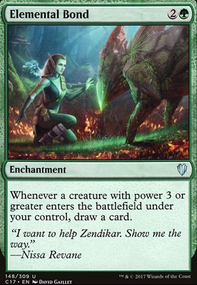 Titania brings a unique approach to the mono-green lands matter archetype. Using fetch-lands and other land-sac-outlets, we create waves of elementals to swarm opponents. Because Titania will be putting a fetchland back into play from graveyard upon ETB, she effectively ramps you by a land and creates a 5/3 each time she resolves. This grants us unnatural resilience to removal, constantly threatening opponents with large boards that can explode into an army at any moment. Non-combat-centric decks frequently find themselves unable to deal with multiple 5/3 attackers each turn, and overrun effects can end the game in a single swing.